As we indicated in our farmdoc daily article of April 9, 2015, the 2014-15 marketing year average farm price of corn, currently projected by the USDA to be in a range of $3.55 to $3.85, will likely be the lowest marketing year average since 2009-10 and about $2.00 per bushel less than the average of the previous four years. Lower prices have resulted in much narrower operating margins for many corn producers and have resulted in a substantial slowdown in machinery and equipment purchases and some downward pressure on cash rent levels and land values. Corn prices during the 2015-16 marketing year will be pivotal in determining if these financial pressures continue, worsen, or are reversed. At this juncture there are differences of opinion about the likely level of prices during the year ahead, with most expecting prices to provide minimal relief from narrow operating margins being experienced this year. USDA projections from the February Outlook Forum include an average farm price for corn of $3.50. This month’s projections from the Food and Agricultural Policy Research Institute (FAPRI) at the University of Missouri include an average farm price for corn of $3.86. Our own projection from an April 1 webinar is for an average price of $4.25. Price projections differ because of different expectations about the supply of corn, the strength of corn demand, and the interaction of supply and demand to determine price. As part of our article last week (April 9, 2015), we estimated the relationship between the U.S. stocks-to-use ratio for corn and marketing year average prices for two eras–1990-91 through 2005-06 and 2007-08 through 2014-15. Separating the observations into two eras resulted in a good “fit,” particularly in the latter period, with the stocks-to-use ratio explaining 86 percent of the annual variation in the marketing year average price in the latter period. In this article, we use a two-step process to form a very early season projection of the average price in the upcoming marketing year. We first project the likely supply and consumption balance sheet for the marketing year based on current information about 2015 corn planting intentions and the likely demand for corn in the domestic and export markets. We then use the 2007-08 through 2014-15 relationship between the marketing year ending stocks-to-use ratio and the average marketing year farm price of corn developed in last week’s article to forecast the average farm price for 2015-16. Finally, we use that same relationship to calculate the stocks-to-use ratio that is implied by other price projections currently available. This will highlight the reasons for differing price forecasts at the present time. Our projections of supply, consumption, and carryover stocks for the 2015-16 marketing year are presented in Table 1. The supply of corn consists of carryover stocks from the current year, imports during the year, and the size of the harvest. Carryover stocks are projected at 1.827 billion bushels which is the projection contained in the USDA’s April 9, 2015 WASDE report. U.S corn imports (excluding the short-crop year of 2012-13) have recently varied from 28 to 36 million bushels, with USDA projecting imports of 25 million bushels in the current marketing year. We use a projection of 25 million bushels for the upcoming marketing year as well. Producers have reported intentions to plant 89.2 million acres of corn this year, pointing to about 81.7 million acres harvested for grain. While acreage and beginning stocks will likely vary from current projections, the primary uncertainty on the supply side is the average yield of the 2015 crop. At this juncture, we use the trend yield projection of 164 bushels developed in our earlier farmdoc daily article (February 26, 2015). Production is projected at 13.4 billion bushels and marketing year supplies are projected at 15.252 billion bushels. Projections of consumption should not be completely independent of prices and price expectations. However, current projections point to abundant supplies and expectations that rationing of use will not be required during the upcoming marketing year. As a result, consumption in most categories of use is not likely to vary substantially with prices in some range around a “modest” level. In particular, demand for food and industrial products is quite price inelastic. Corn demand for ethanol production may also be very price inelastic over a wide range of prices given the mandate for consumption and the constraint of the 10 percent blend wall. Corn export demand will be influenced by a wide range of factors in addition to price. Historically, domestic feed consumption is thought to be most responsive to corn prices. Even in that sector, however, livestock production decisions implemented over the next few months will largely determine feed use of corn next year. Here we make consumption projections independent of price expectations, while acknowledging that to some extent consumption and price are determined simultaneously. Consumption projections by category are slightly higher than the most recent USDA projections for the current year. Feed and residual use during the current marketing year is projected at 5.25 billion bushels based on first half use of 3.681 billion bushels implied by the USDA’s December 1, 2014 and March 1, 2015 stocks estimates. Since the seasonal distribution of feed and residual use is not constant from year-to-year, there is the potential for use to differ from the current projection. We judge that use could exceed the forecast due to the expansion in livestock numbers currently under way. That expansion should support feed and residual use next year as well, which we project at 5.35 billion bushels. Corn use for ethanol production is projected at 5.2 billion bushels for the current marketing year. We project use at 5.225 billion bushels for the upcoming marketing year, reflecting expectations that domestic motor fuel consumption will increase slightly and ethanol exports will remain near the level expected for this year. While the EPA’s announcement regarding the magnitude of biofuels mandates for 2015 and 2016 expected in June may have some impact on actual ethanol production and corn use, the domestic ethanol blend wall will continue to constrain consumption. Non-ethanol domestic processing use of corn is projected to increase by 15 million bushels, to a total of 1.41 billion bushels, which is in line with the long-term trend increase. Exports of U.S. corn are most difficult to anticipate due to uncertainties about world production of competing grains, world economic growth, and currency values. We expect exports to be within the 1.54 to 1.98 billion bushel range of the previous seven years (excluding the unusually small exports of 2012-13) and project exports at the average of 1.82 billion bushels experienced during that period. Total consumption is projected at 13.805 billion bushels, leaving carryover stocks of 1.447 billion bushels. That projection represents an ending stocks-to-use ratio of 10.5 percent. The relationship between the stocks-to-use ratio and marketing year average price of corn estimated over the period 2007-08 through 2014-15, as described in the April 9 farmdoc daily article, is presented in Figure 1. Based on that relationship, the projected stocks-to-use ratio of 10.5 percent points to a 2015-16 marketing year average price of $4.65. The forecast of $4.65 should be viewed with some reservation, even if the balance sheet has been correctly projected, for at least three reasons. First, there has been enough variation in the relationship between stocks and price over the past eight years that the relationship in 2015-16 could deviate from the predicted value based on the fitted relationship in Figure 1. Second, while not yet reflected through the current marketing year, some weakness in corn demand could result from a continuation of strength in the U.S. dollar. Such weakness would result in lower prices for a given stocks-to-use ratio. Third, small changes in the projected stocks-to-use ratio have a relatively large impact on expected price, particularly at smaller ratios of stocks-to-use. We are reluctant to forecast an average price as high as implied by the projected stocks-to-use ratio. Still, an even more modest projection would be above the most recent forecasts made by others and above current market prices for the 2015-16 marketing year. x = 43.63/(3.50 – 0.49)= 14.5. Note that the supply and consumption balance sheet which was the basis for the USDA price projection shows a stocks-to-use ratio of only 12.3 percent. Those balance sheet and price projections will be updated in the May 12 WASDE report. The most recent price projection of $3.86 provided by FAPRI implies a stocks-to-use ratio of 12.9 percent based on the estimated relationship in Figure 1. The supply and consumption balance sheet on which the FAPRI projection was based shows a stocks-to-use ratio of 12.0 percent. Futures prices for the 2015-16 marketing year can also be used to estimate the 2015-16 average farm price expected by the market. At the close of trade on April 15, those prices ranged from $4.00 for the December 2015 contract to $4.24 for the July 2016 contract. We argued in a farmdoc daily article on February 4, 2015 that with typical basis and futures contract spreads, the December contract could be used as the current forecast of the marketing year average farm price. Alternatively, an earlier farmdoc daily article (February 17, 2015) by Gary Schnitkey reports that the marketing year average farm price as a percentage of the projected price for crop insurance (average of December futures prices in February) has varied considerably over time, but has averaged 95.7 percent. Using that ratio, this year’s projected price for crop insurance of $4.15 points to a marketing year average farm price of $3.97. Finally, a futures-based model for forecasting the marketing year average farm price developed by the USDA Economic Research Service would point to a 2015-16 marketing year average farm price of $3.84 based on current futures prices. The market expectations for the 2015-16 marketing year average price of corn appear to be in a range of $3.84 to $4.00, implying a stocks-to-use ratio ranging from 12.4 to 13.0 percent. 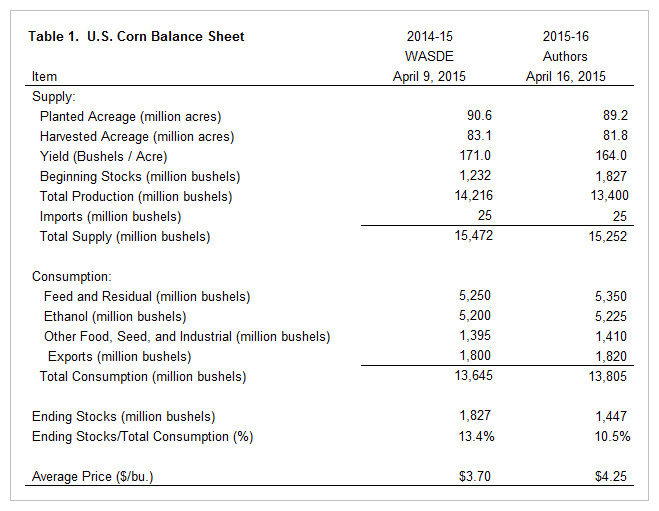 Our current projected 2015-16 corn balance sheet points to an ending stocks-to use ratio of 10.5 percent. That compares to ratios ranging from 12.0 to 14.3 percent implied by other balance sheet or price projections. Some of the difference with other projections lies in different balance sheet projections. Our projected yield and crop size is smaller than projected by others and probably smaller than expected by the market. In addition, our projection of 2015-16 marketing year consumption is 50 million bushels larger than the latest USDA projection and 150 million bushels larger than the FAPRI projection. Finally, others may draw different price implications from the same projections of production, consumption, and ending stocks. The USDA, for example, appears to be expecting a much weaker demand structure than what we forecast. That weaker demand would be expressed as a leftward shift in the relationship between the price of corn and ending stocks-to-use. Our analysis suggests there is potential for new crop corn prices to move higher if: i) this year’s growing season points to a U.S. average yield at or below trend value of 164 bushels; and/or ii) demand is not as weak as some appear to be assuming. We maintain expectations for a 2015-16 marketing year average price near $4.25. Good, D., and S. Irwin. 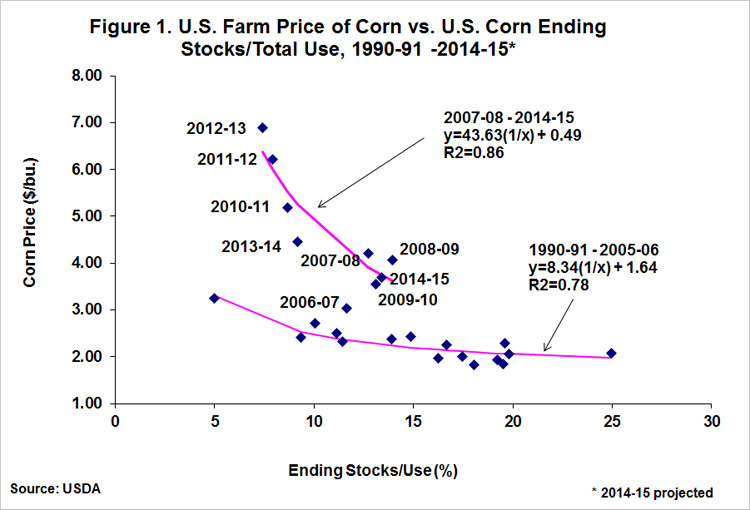 "The Relationship between Stocks-to-Use and Corn Prices Revisited." farmdoc daily (5):65, Department of Agricultural and Consumer Economics, University of Illinois at Urbana-Champaign, April 9, 2015. Irwin, S., D. Good, and J. Newton. "Corn and Soybean Stocks, Acreage, and Balance Sheet Implications." 2015 Spring Webinar Series Videos, Department of Agricultural and Consumer Economics, University of Illinois at Urbana-Champaign, April 1, 2015. Irwin, S., and D. Good. "Forming Expectations for the 2015 U.S. Average Corn Yield: What Does History Teach Us?" farmdoc daily(5):36, Department of Agricultural and Consumer Economics, University of Illinois at Urbana-Champaign, February 26, 2015. Irwin, S., and D. Good. "Long-Term Corn, Soybeans, and Wheat Price Forecasts and the Farm Bill Program Choice." farmdoc daily (5):20, Department of Agricultural and Consumer Economics, University of Illinois at Urbana-Champaign, February 4, 2015. Schnitkey, G. "Forecasts of 2015 Market Year Average Prices based on Projected Prices for Crop Insurance." farmdoc daily (5):29, Department of Agricultural and Consumer Economics, University of Illinois at Urbana-Champaign, February 17, 2015. USDA Economic Research Service. "Using Futures Prices to Forecast the Season-Average Price, Price Loss Coverage (PLC) Payment Rate and Counter-Cyclical Payment (CCP) Rate for Corn, Soybeans, and Wheat." Updated April 09, 2015, accessed April 16, 2015. Could the Corn Carryout Really Reach Two Billion Bushels? Will Soybean Consumption Reach the USDA Projection?